Put Chicken in a baking pan. Coat with Olive Oil, Pepper, Curry seasoning evenly. Cook at 350 degrees for 45 min. Let Chicken cool, then dice into bite size pieces. Combine Yogurt and Yellow Curry in Blender to make the dressing. Add Celery, dressing, shallots, garlic, onions, and raisins to chicken. Stir well and store in fridge. The longer it sits the more flavorful it is! 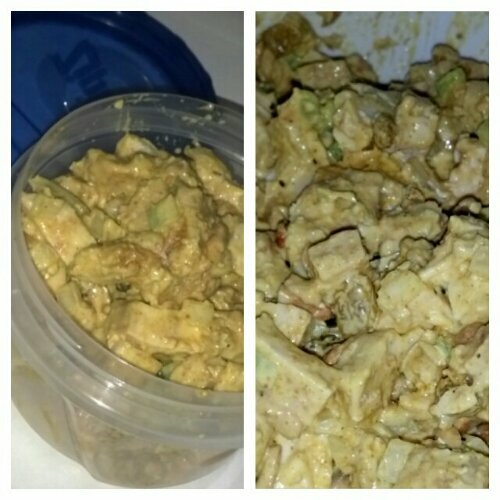 Curried Chicken salad is the perfect meal to make on Monday so you have lunch for the rest of the week!